Be sure your little baker uses the oven mitt to remove these four delectable-looking wooden cupcakes from their cupcake baking tray! 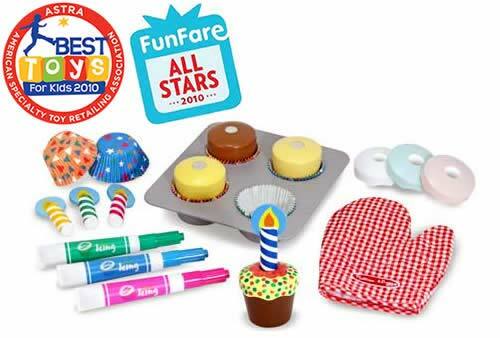 This special set has three dry-erase markers shaped like icing tubes to decorate the smooth, removable, wipe-off cupcake tops. With colorful baking cupcake sleeves and decorative wooden candles, these low-cal cupcakes will be the hit of birthday and tea parties!